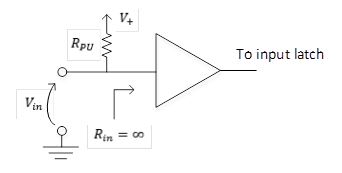 Describes whether a general-purpose I/O (GPIO) pin is configured as an input or an output, and how values are driven onto the pin. Configures the GPIO pin in floating mode, with high impedance. If you call the @Windows.Devices.Gpio.GpioPin.Read?text=GpioPin.Read method for this pin, the method returns the current state of the pin as driven externally. If you call the GpioPin.Write method, the method sets the latched output value for the pin. 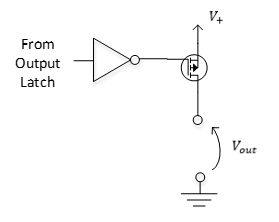 The pin takes on this latched output value when the pin is changed to an output. 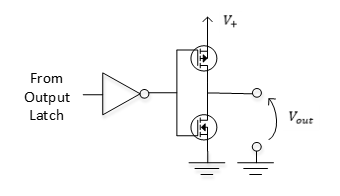 Configures the GPIO pin as high impedance with a pull-down resistor to ground. If you call the @Windows.Devices.Gpio.GpioPin.Read?text=GpioPin.Read method for this pin, the method returns the current value of the pin as driven externally. 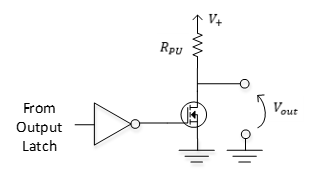 Configures the GPIO pin as high impedance with a pull-up resistor to the voltage charge connection (VCC). If you call the @Windows.Devices.Gpio.GpioPin.Read?text=GpioPin.Read method for this pin, the method returns the value previously written to the pin. Configures the GPIO pin in strong drive mode, with low impedance. If you call the @Windows.Devices.Gpio.GpioPin.Write(Windows.Devices.Gpio.GpioPinValue)?text=GpioPin.Write method for this pin with a value of **GpioPinValue.High**, the method produces a low-impedance high value for the pin. If you call the @Windows.Devices.Gpio.GpioPin.Write(Windows.Devices.Gpio.GpioPinValue)?text=GpioPin.Write method for this pin with a value of **GpioPinValue.Low**, the method produces a low-impedance low value for the pin. If you call the GpioPin.Read method for this pin, the method returns the value previously written to the pin. Configures the GPIO in open drain mode. If you call the @Windows.Devices.Gpio.GpioPin.Write(Windows.Devices.Gpio.GpioPinValue)?text=GpioPin.Write method for this pin with a value of **GpioPinValue.Low**, the method drives a value of low to the pin. If you call the @Windows.Devices.Gpio.GpioPin.Write(Windows.Devices.Gpio.GpioPinValue)?text=GpioPin.Write method for this pin with a value of **GpioPinValue.High**, the method places the pin in floating mode. Configures the GPIO pin in open drain mode with resistive pull-up mode. 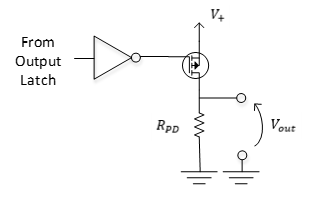 If you call the @Windows.Devices.Gpio.GpioPin.Write(Windows.Devices.Gpio.GpioPinValue)?text=GpioPin.Write method for this pin with a value of **GpioPinValue.Low**, the method produces a low-impedance low state. If you call the @Windows.Devices.Gpio.GpioPin.Write(Windows.Devices.Gpio.GpioPinValue)?text=GpioPin.Write method for this pin with a value of **GpioPinValue.High**, the method configures the pin as high impedance with a pull-up resistor to VCC. Configures the GPIO pin in open collector mode. If you call the @Windows.Devices.Gpio.GpioPin.Write(Windows.Devices.Gpio.GpioPinValue)?text=GpioPin.Write method for this pin with a value of **GpioPinValue.High**, the method drives a value of high onto the pin. If you call the @Windows.Devices.Gpio.GpioPin.Write(Windows.Devices.Gpio.GpioPinValue)?text=GpioPin.Write method for this pin with a value of **GpioPinValue.Low**, the method configures the pin in floating mode. Configures the GPIO pin in open collector mode with resistive pull-down mode. If you call the @Windows.Devices.Gpio.GpioPin.Write(Windows.Devices.Gpio.GpioPinValue)?text=GpioPin.Write method for this pin with a value of **GpioPinValue.High**, the method drives a value of high onto the pin. If you call the @Windows.Devices.Gpio.GpioPin.Write(Windows.Devices.Gpio.GpioPinValue)?text=GpioPin.Write method for this pin with a value of **GpioPinValue.Low**, the method configures the pin as high impedance with a pull-down resistor to ground.